When I was a kid Christmas was about toys. It was all about the tree, the ornaments, and the packages under that tree. It was all about the things. I was more focused on the things that I gave, or that I got, than I was on the experiences. I mean it wasn’t just about what I myself got. I was equally excited by the presents that others around me received. But still, it was all about things. As I get older I find I don’t really care about the gifts much at all. Now I’m all about the experiences that the holidays bring. The traditions that we build, layer upon layer, year after year, as a family. And so many of those traditions focus on food. Tuna dip and nanaimo bars at the big family parties, my mom’s classic French Canadian tourtière on those busy holiday nights, turkey and stuffing Christmas eve, buckwheat waffles for Christmas day breakfast, my mother-in-laws scalloped potatoes with Christmas dinner, the local sausage we always serve with cheese and crackers on New Years…. food, food and more food. Which holiday classics are a must have at your family parties? What recipe do you find yourself making each year at this time? When I think of going to mom’s for Christmas I always think of the coffee. I am not even kidding. My sister knows, it’s the first thing I’ll ask for when I walk in the door, and she often will put a cup on for me while I’m helping the kids take off their boots and get settled. I used to love visiting just so I could try out different flavours in her k-cup machine. However a few months back I finally got my own Keurig, so now I don’t have to wait to visit to get my hands on a cup of Van Houtte Holiday Blend. Much like other holiday classics, the Van Houtte Holiday Blend coffee or Holliday Spice Latte is a taste that is only around this time of year. It’s one that complements many of the traditional holiday dishes… and even doubles as an ingredient! Seriously, check out the Van Houtte website for their spin on Nanaimo bars, stuffed turkey breast and mini tourtières, all made using Van Houtte’s holiday blend. Adding coffee to the tourtière mix is something I’d never considered, and I’m eager to give it a shot when I get together with my mom to make pies next weekend. In the meantime I want to hear what your favourite holiday dish is. Share one of your favourite holiday classic recipes in the comments below for a chance to win a holiday classics prize pack from Keurig and Van Houtte! 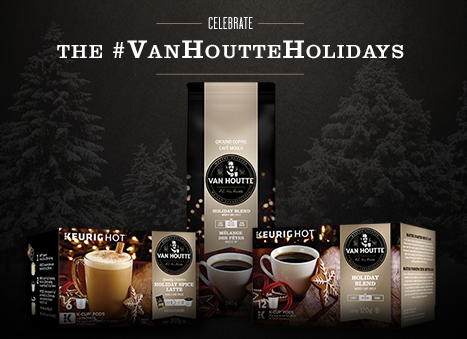 and a selection of Van Houtte holiday products. This giveaway is open to Canadian residents only. Disclosure: This post was sponsored by Van Houtte. As always my words and opinions are my own. My favourite holiday recipe is buttertarts and pete de soeurs. Love those during the holidays so tasty. Pete de soeurs are so easy to make with the left over dough from the buttertarts. Butter, brown sugar and cinnamon and you are good to go. My mom used to make something similar with her leftover pie dough. She called them sugar dogs and they were my favourite part of her making meat pies for Christmas! One of my favorite holiday treats is my Cinnamon Coffee Cake. So easy to make with basic ingredients. I make several of them every year for a treat exchange..
One of my favorite holiday recipes is for White chocolate,cranberry cheesecake bars. I like shortbread cookies at Christmas! I love my MIL’s German Cabbage! Stuffing is, hands down, my all time favourite holiday dish!! One of my favourite holiday meals is the Prime Rib Roast, absolutely the best!! one of my favourite holiday recipes would be gingersnaps..usually only make them at Christmas but sometimes I miss them and make them through the year..
One of my favourite recipes is our shortbread thumbprint cookies with a chocolate candy kiss in the middle. So yummy and you can never eat just one! I love making festive fudge for the holidays. I absolutely love Honey Glazed Carrots as a side dish! They are super easy to make and are sooo tasty! I love home made stuffing.Not sure what the recipe is. M sister makes awesome almond bars. Honey baked sugar ham is my favourite. I could eat that for days. My favourite holiday dish is butter tarts. I don’t have a recipe, but my mom makes an incredible one. Perogy’s and cabbage rolls are my fav! Whipped Shortbread and Cherry Loaf! My sister in laws rum balls are the best! I love classic Nanaimo Bars. I’m obsessed with stuffing and this bean casserole dish my husband aunt makes. Millionaire Bars are one of my favourites! My Mom’s 5 bean salad. My favourite holiday dish is garlic mashed potatoes. I make home made donair eggrolls they are a big hit. Homemade stuffing with apple. The apple adds moisture and a touch of sweet. I love making a bouche de noel! My favourite holiday dish has to be my moms stuffing! It includes lots of diced veggies, apples, cinnamon, nutmeg, and at least a half bottle of white wine! My favourite holiday dish is Broken Glass cake my mom only makes it on Christmas Eve. Our stuffing…………I love it! My eldest daughter makes it every year and its just amazing! Not very complicated, just onions, celery, butter, poultry seasoning, salt, pepper and good old crusty buns! My family loves my Roasted Garlic Mashed potatoes. The trick is to roast the garlic heads yourself. A little picky peeling them after but well worth the effort! My favourite Holiday recipe is peanut butter balls. My adult children still request peanut butter balls and my husband loves dark Christmas cake. My favourite holiday recipe is pineapple honey glazed ham. My mothers roast turkey dinner is one my favourite holiday dish. My mom makes a delicious cranberry rosmeaey roasted pork loin. It’s definitely my favourite holiday recipe. One of my favorite holiday dishes is Christmas pudding and it’s oh so sweet with the caramel sauce on top. My favourite holiday dish is Tourtière, we make it every year on Christmas eve. My favorite recipe is glazed roast turkey. My favorite Christmas treat is meat pies and shot bread cookies. Gingerbread cheesecake! I can’t wait! my favorite holiday treats are cookies…all the kinds all the time 🙂 Yum! My favorite holiday dish is my mom’s pierogies! My favourite is salmon dip with a variety of crackers for spreading. It’s very tasty! I like to have butter tarts at Christmas. My favourite holiday food is stuffing, oh so yummy! My favourite holiday dish is mashed potatoes – basic, but so delicious. My favourite recipe to use is “Elsie’s Potatoes” from the Best of Bridge book series – they always turn out really well. My favourite is decorated sugar cookies. It is fun to make them with my daughter and even better eating. I am a big fan of green bean casserole, probably because we only make it about twice a year! One of our favourite holiday deserts is gingerbread cookies that I make. One of my favourite holiday desert dishes is gingerbread cookies. I love the holiday sweet potato pie. It just melts in your mouth! My mother guards the recipe though. I love clementines at christmas and I’ve got to have my peas as a side dish. A favourite holiday dish is Brussels sprouts in butter sauce..
Roast turkey is always my favourite holiday dish. My favorite holiday recipe would be gingerbread cookies! Yum! My favourite is Nanaimo bars – but the regular crust, not the chocolate crust. I really love pecan bars. I”m trying a low-carb version sometime this week. No doubt. It’s turkey all the way. I love to make cakes from scratch, top to bottom. Most of my recipes are complicated, but it’s worth it. My favourite holiday dish is peas pudding! YUM!!! A newfoundland tradition! I absolutely adore peanut butter balls and my mom’s marshmallow squares. Pecan pie is my favorite holiday dish. I love my great grandmothers shortbread recipe! One of my favourite recipes is Broken Glass dessert. We have it every Christmas dinner. It has a variety of colours of jello with whipped cream and a graham wafer crust. I love gravy and turkey. Its the best! I just tried making Snickerdoodles this weekend for the first time ever. Brought some into work and they were a hit. I’ll definitely be making them more often. It’s our tradition to have rice pudding every christmas. My mother in law makes it. So good! I’m from Europe, so Mushroom dumplings (pierogies) with Beet borscht. Would love to have a keurig my entertaining events in the new year! I like a Christmas morning casserole dish, made with Egg Creations, almond milk, mustard powder, cheese, back bacon, and thin slices of bread. I am a sweet lover,and at Christmas I especially love the shortbread and gingersnaps. Who can forget that cherry cheesecake that is always the first dessert to go! My mother’s recipe for turnip/carrot/parsnip casserole. Lots of nutmeg and cinnamon, with breadcrumbs on top. It’s all caramelized and delish fresh out of the oven. The only time of year we have turkey with all the trimmings! I love turkey and having turkey sandwiches with the leftovers the next day. My favorite dish is Pumpkin Pie…but I actually use carrots instead of pumpkin puree. Cranberry orange cookies are a favourite holiday treat in our house! One of my favourite holiday treats is Fudge Puddles. My mother makes amazing stuffing. Definitely a favourite year round. Honestly, Shortbread is my favourite holiday dish… Followed by Roast Turkey and Garlic Mashed Potatoes. Oh wow – this ‘Rudolph’s Antler’s Holiday Cookie Recipe couldn’t be easier to make! Love that is also fits my budget. Thanks you!! Stuffing is one of my favourite holiday dishes because I so rarely have it at any other time. Turkey with gravy is my favourite holiday dish! My favorite holiday recipe’s is a good old fashion rum cake. I make vegan gingerbread cookies. My favourite holiday recipe is my mother-in-law’s sweet potato casserole. Homemade stuffing is my fav! My favourite holiday dish is my dad’s butter chicken lasagna! So excited to go home for that! I love to make hermit cookie every year. My favourite holiday treat is apple strudel. Turkey and stuffing is my fave holiday dish! My favorite holiday dish is Turkey stuffing. Never is enough. The buttery cream cheese garlic mashed potatoes my mom makes is my favorite! Mostly love the coffee and Irish Cream Liqueur 🙂 No recipe needed! I enjoy Cranberry loaf. A simple recipe and tastes good. My favourite holiday dish is cheesecake, we don’t really celebrate Christmas but we always make this during this time of the year and it’s so good oh my!! I love fruit trifle we only ever have it Christmas time. I am always in charge of bring scalloped potatoes. My signature dish! Our favorite holiday recipes are Christmas Crack and my late father’s Christmas Stuffing. Family traditions!! I love my mom’s stuffing, her mashed potatoes and corn and her turkey dressed with bacon. Yum-o! Homemade stuffing has to be my favourite. ooh so tough to choose but we do a cinnamon roasted squash and it’s pretty darn amazing! My Almond Fudge Bars are a huge hit at Christmas – very rich, fudgy and taste as good straight out of the freezer as they do fresh! My favourite holiday treat is Nanaimo bars! Cran-Apple turnovers with cinnamon Crème is my holiday fave dessert! Crazy for my Moms sweet bread, she makes it at Christmas and Easter and boy does she make enough to go around since its requested by everyone. I love the extra’s like whole wild cranberries sauce, Gravy, and pumpkin pie. delicious. I love eating shortbread on the holidays. It is a tie between plum pudding and trifle for me!! My aunt’s pizzelle are my favorite Christmas treat. I make them in her honor, each year. My favorite is traditional Christmas Pudding topped with real thick cream. Does shortbread count as a “dish” because it’s my favourite holiday food. I save up all year for it and eat a years worth! I love a cream cheese topped with cranberry salsa and crackers!!!! My family enjoy having chocolate truffle mice over the holidays. I love freezer cheese cake. It is so easy to make and my boys love it very much. I really like homemade pumpkin pie during the holidays. Thanks. I love van houtte coffee!! one of the best coffees!! I always make Sugar Cookies for my husband at Christmas-they’re his all time favourite! My favorite is homemade eggnog. Shortbread cookies with milk chocolate is my favourite holiday treat. Spread pretzels on sheet. Cook butter/brown sugar on medium on stove. Let boil for 3minutes. Pour over pretzels. Bake for 5 ‘min at 350 degrees. Pull out & drop chocolate chips on top. Put in oven for 2 minutes. Take out use spautla to spread chocolate all over covering pretzels. Cool . Break into chunks. My favorite is the red velvet cake pops. One of my favorites is a cheesy hashbrown casserole or my mom’s homemade turtles. I love sausage stuffing. I just use box stuffing mix and add cooked crumbled sausage. i love making newfie style stuffing with gluten free bread, onions, chicken stock, savoury and salt and pepper. My gramma used to make this special holiday jello salad, it was empty so quick everyone ran for it first. She passed suddenly and the recipe was only in her head. The grandchildren have tried constantly and noone can seem to duplicate it. We loved when she was giggling bringing it out…. Such memories! Our holiday favourite is a rotisserie ham.. delicious! i love homemade cranberry sauce. my kids eat it on it’s own! My favorite holiday dish to make and eat is scalloped potatoes with lots of cheese! I love my Mum’s Broccoli Casserole. My favourite holiday treats are all butter shortbread cookies. My favorite Holiday Treat is Gingerbread. Anything Gingerbread, Cookies, Bread, Cake if it is Gingerbread I am good to go! Stuffing and gravy is my favorite part. My favourite holiday dish is cherry cheesecake. My family prefers them oven roasted with a package of bacon! One of my favourite holiday meals is the surf & turf dinner that we enjoy on Christmas Eve.